I've been a bit under the weather this week, which means I've spent quite a bit of time on the computer getting absolutely nothing done. I was hoping to have a ton of 'Making Home' posts up this week, but it just didn't happen. I also totally dropped the ball on Anshu's Ringer Onsie Sew- A- long. And oh yeah-- Leftover Quilt Pictures! What can I say, I'm a blogging flunkie. But I do have a cute project that will hopefully make you smile. 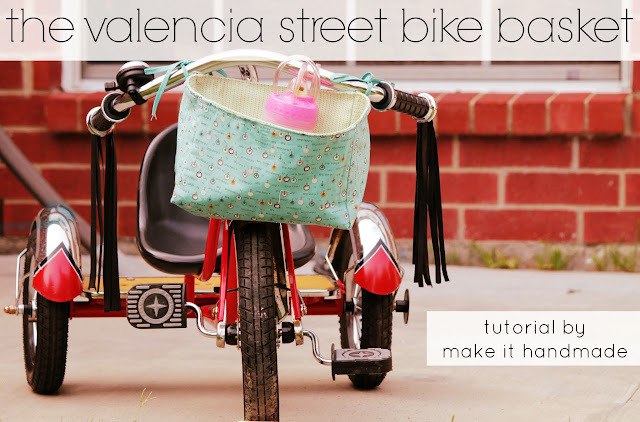 The Valencia Street Bike Basket! This project first appeared at the Bakeshop; but I'm so happy to be able to share it with you today! My biggest little one just 'graduated' from his tricycle to a 2 wheeler with training wheels. So far, his bike rides have been limited to riding from the backyard to the front yard; but I know this is just a sign of more independence to come. To send him on his way in style; I decided to make him (and his sister) bike baskets to take with them where ever they go. These bike baskets are made with just 2 fat quarters and a bit of interfacing or batting and are deep enough to accommodate all the summer essentials-- a teddy bear, a princess cup, and those pebbles that were too shiny to leave at the park. The very best part? At the end of the summer; you can toss them in the wash, and they'll look brand new for the first day of school. And even though Valencia Street Bike Basket was designed for the preschool set, it's large enough that you can 'borrow' it for your own adult bike. These bike baskets come together very quickly! I was able to finish the red and black bike basket (my second one) in about half an hour; from cutting to loading it up with stuffed animals. When deciding whether to make a velcro or ribbon closure, consider the the bike-- ribbon closures will work on any bike or trike. To use the velcro closure you must have a bike with a bar between the handle bars. 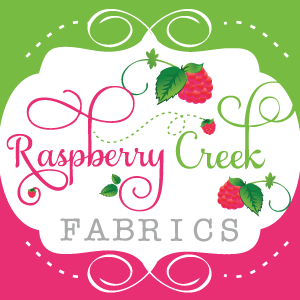 If you are using fusible fleece or interfacing fuse the lining and interfacing together before starting. If you are using quilt batting or a sew in interfacing, pin the batting/interfacing to the wrong side of the lining, and treat them as one piece of fabric from this point on. I used a heavy canvas lining which you will see in the pictures. Trim the two fat quarters to get rid of the selvage and ensure they are the same size. Fat quarter sizes vary slightly from brand to brand; but this tutorial will work as long as your pieces are the same size. Fold your outer fabric fat quarter into fourths. Cut a 6 inch square from the corner without any folds. Do this for the lining as well. Set those squares aside- we might be using them later! When you unfold the fat quarters, you should see something like a chubby plus sign. The middle is the base of the basket, while the 'arms' of the plus sign are the sides. 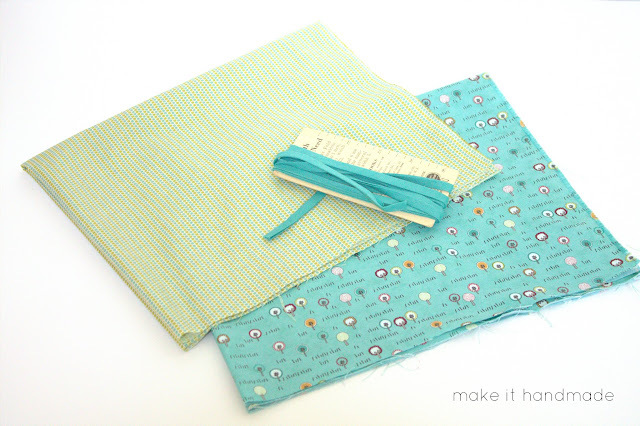 Using the outer fabric, fold the corners together as shown and sew with a 3/8 seam allowance. In the picture below, I'm sewing the bottom left corner. To insert the ribbon ties, pin the 12 inch strips of ribbon 1 inch from the top of seam before sewing the last two corners together. Do this on opposite corners of one of the long sides. Do this for the same thing (without the ribbons) for the lining. When you are finished you should have two 'baskets'-- one much floppier than the other. Press the outer fabric seam allowances toward the short sides of the basket; and press the lining seams towards the long sides of the basket. With right sides touching, place the outer basket in the lining basket. Pin all the way around, making sure to nest the seams as you go. Sew all around using a 3/8 seam allowance leaving a small opening for turning. Turn your project through that small opening and press! Top stitch a 1/4 inch from the top of the basket making sure to close the opening you left for turning. You are finished and ready to ride! I knew my son wouldn't appreciate those oh-so-girly ribbon ties; so his basket has a velcro closure. The velcro closure will only work on bikes with a bar between the handle bars. To add velcro, first make up a basket just as before; leaving out the ribbon. Take 2 of the 6 inch squares set aside earlier and place them right sides together (layer the batting on the outiside. Stitch around all sides of the square leaving a small hole for turning. Turn the square out and press well. Sew the velcro to the square as shown. Position and pin the velcro patch so it is centered horizontally and overhangs the basket on top by about an inch. Attach the square to the basket with two lines of stitching-- one across the middle of the square and one above the bottom piece of velcro. Although you will see the stitching on the inside of the basket, stitching through the outer fabric, lining and interfacing will give the velcro band more strength. If you can't find matching ribbon for the ribbon ties; you can use a leftover square to piece together 4 12 inch 'ribbons'. For the velcro strap, if you have access to the bike, consider making the strap the exact length of the bar. This will make the strap even sturdier and the basket better able to handle heavy loads. Consider using one of your scrap squares to applique a name or initial to personalize the basket for your little one. 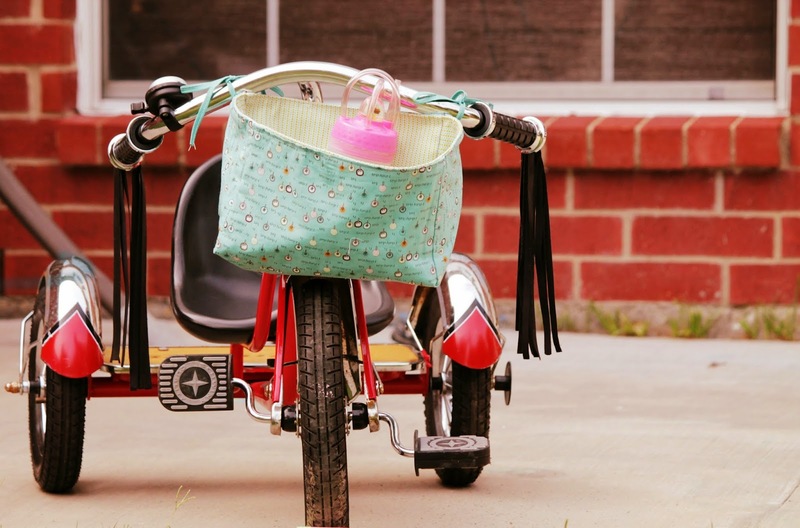 This makes one stylish bike basket-- so your preschooler can take a little bit of home where ever he may roam. I'm ashamed to say that I loved these baskets so much that I stole them back from my kids! They now live in my sewing room. :) I guess I'll have to whip up a few more for them!